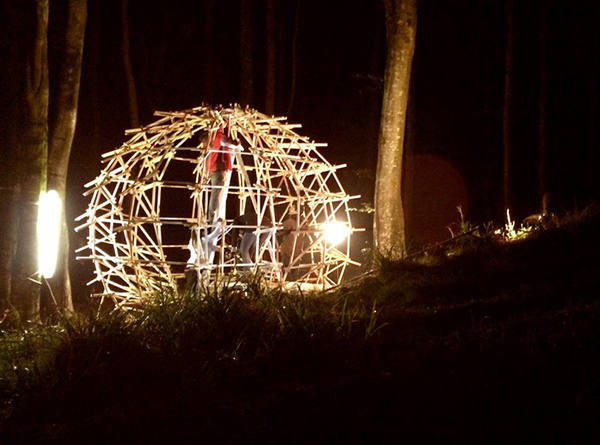 MakeLab 2015 focused on the theme of ‘performative envelopes’, designing and testing the potential environmental, social and ergonomic performance characteristics of lightweight and site-specific inhabitable structures. Using straightforward rule-based design processes, the project explored synergies between digital fabrication and the principles of generative design. 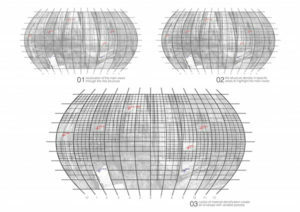 To create a single inhabitable structure in the forest, the project used a sphere typology to gather different densities and views of the sky dome, surrounding a strategically chosen site with various views towards the surroundings. 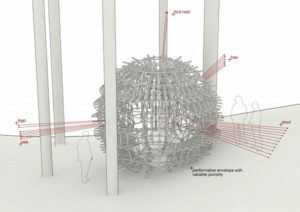 The viewing information was gathered using panoramic mapping of views and reference points using a webcam and Knect 3D scanner mounted on a pivoting point at the centre of the sphere. Through the digital design processes developed during the workshop, the mapping of different light intensities and views was translated into different material densities within the enclosure, resulting in a series of customised ribs with different local thicknesses. Three platforms built onto the sloping terrain gave access to the six specific viewing positions inside the sphere, inviting visitors to engage with the architecture and experience height level differences and related shifts in perspective towards the surrounding landscape.